Beijing compelled local governments and state-owned enterprises to take on massive debt for giant infrastructure projects. Yes, they simply built ghost cities. The intention was to put people to work and bolster public confidence. But it’s how they grew that debt I find amazing. 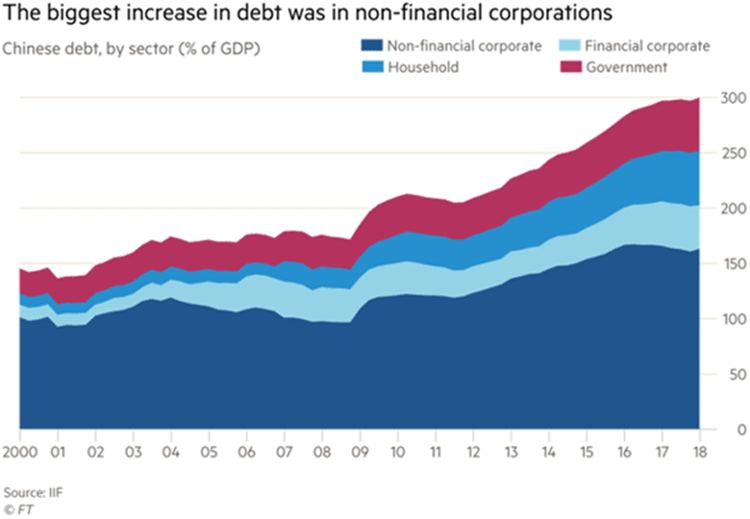 Half of the total debt is from the nonfinancial (i.e., shadow banks) sector. So, China could owe non-Chinese lenders as much as $3.5 trillion. Much of it is in USD which are more expensive than they used to be. This is why a trade war is so threatening to China. Revenue from exports to the US helps pay that debt. The internal debt is also a problem. Yes, a state-dominated economy like China’s can deal with debt in its own currency. It has many ways to extend and pretend. But they have limits and don’t work forever. The debt eventually has to be worked off. Worse, debt is like drugs to which the body adapts. Then you need more to get the same effect. 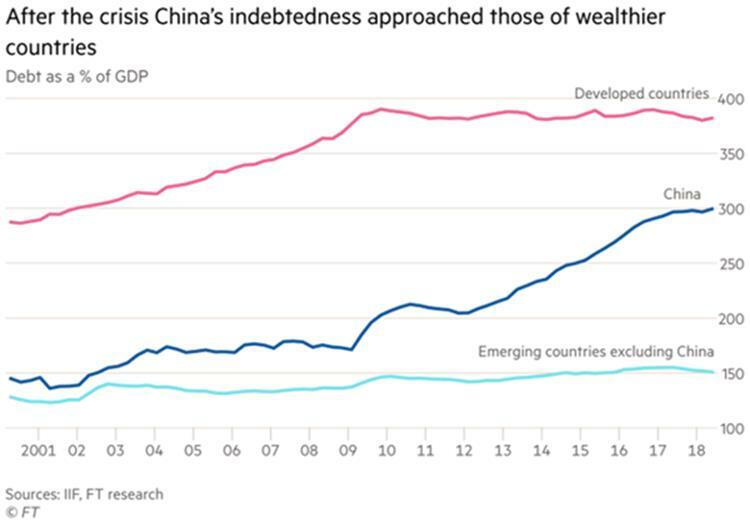 Likewise, debt is no longer having the same effect on China. An IMF study last year estimated that in less than a decade, the amount of debt needed to produce the same GDP output more than tripled. That tells us something important. In the next downturn, slowdown, or whatever you call it, Beijing may not be able to borrow its way out of the hole. But absent debt stimulus, what else can they do? I seriously doubt Xi Jinping has any way to restore growth to what everyone wants without massive adjustments. That being the case, it’s not the best time for a trade war between the US and China. Yet we find ourselves in one. But it does not mean that slapping tariffs on Chinese imports is the right answer. We have to fix these things, but without shooting our own feet. American and Chinese businesses have spent the last two decades integrating supply chains. The markets have been built on this integration. Every one of us benefits from it every single day. Could we reverse the integration and become less interdependent? Yes, of course. It’s happening already due to technology that is moving production closer to consumers. That’s a natural process that will continue. Rushing that process, while probably possible, would have a cost. One of my greatest short-term fears is that Trump’s hardline tactics will push China into recession. For them, less than 4% growth. The president himself seems to relish the prospect. He’s talked proudly of the way Chinese markets fell due to his policies.